A good date to remember to stop cutting back your mums is July 4th. This should make for a nice round full plant come fall when it starts to bloom. Temperatures are warming up so extra watering might be necessary for your potted plants and hanging baskets. Follow our Watering Guide to keep your plants thriving and looking fabulous all summer long! You can also give leggy perennials a cut if they are flopping over and looking brown. I do this with my hostas and widow’s tears and they come back in no time looking better than ever. I little TLC and your plants will love you back my promising continuous green foliage and colorful blooms. Blooming this month: Veronica, Rudebeckia, Hardy Lily and Coreopsis and many many more. Time to start cool weather crops for fall! Check the germination periods on the packets and stagger your planting dates to have continuous vegetables throughout fall. Keep an eye on your tomato plants and other vegetables for disease. If your garden is prone to disease, try planting a different vegetable in that spot next year. 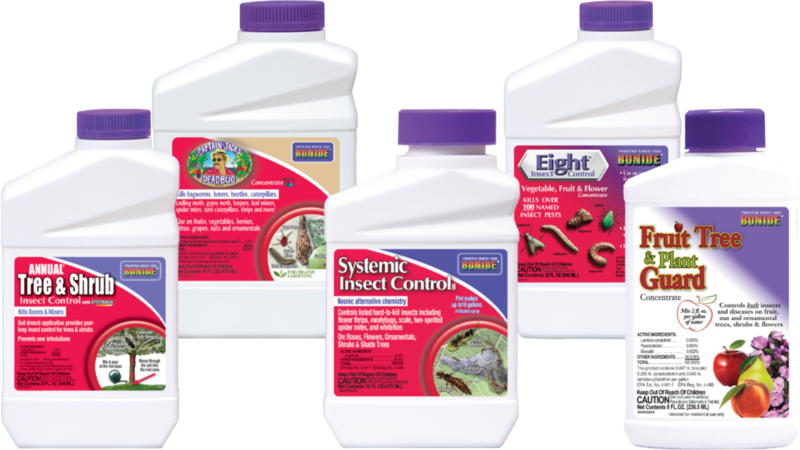 We carry organic products for disease and pest control that will help you maintain a healthy lifestyle. 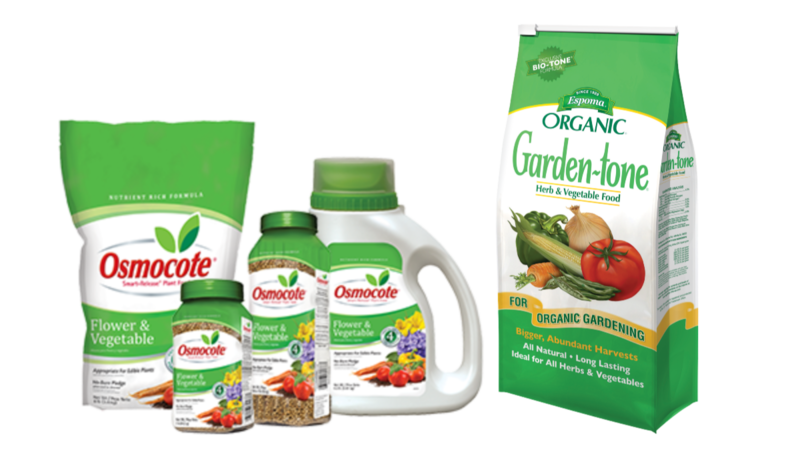 Give your fruits and vegetables a dose of fertilizer with Espoma Garden-tone or Osmocote Flower & Vegetable Smart Release. Giving them a boost will get them thru the warm/hot days ahead. Keep sensitive trees watered by using Gator Bags that will keep them hydrated with up to 20 gallons of water that is slowly released over the root ball over a 15-20 hour time span. For shrubs or trees you can use a soaker hose as well. This method sends water to the plants at a slow enough pace that is absorbed easily by the root systems. Disease and insects are abundant around this time of year due to humidity. Other factors may come in to play as well, so keep an eye on your landscape plants. 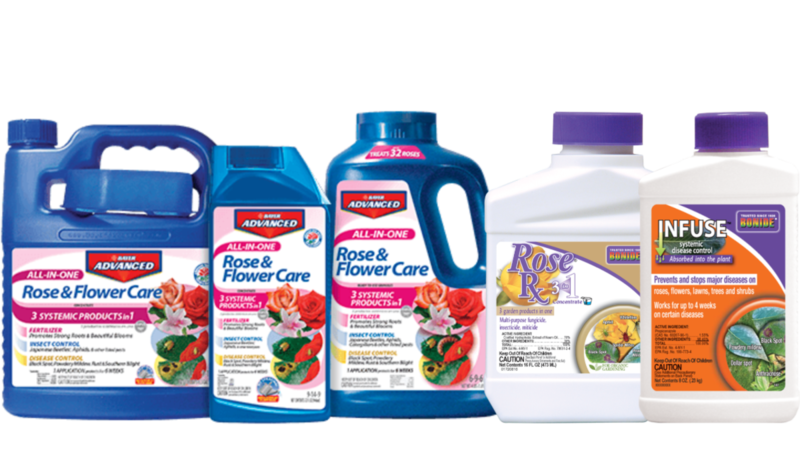 Roses can be sprayed for black spot using Bonide Fung-onil, RoseRx or Infuse or Bayer Rose & Flower Care. Arborvitea and other evergreens can be sprayed for bagworms using GardenTech Sevin, Bonide Eight or Captain Jack’s Dead Bug Brew. Pieris japonica, azaleas and other plants can be treated for lacebugs by using Bonide’s Eight, Systemic Insect Control, Fruit & Tree Spray or Annual Tree & Shrub. Japanese beetles are becoming a nuisance this time of year, particularly if you hadn’t treated your lawn for grubs. (See our monthly lawn tips here). There are several types and styles of Japanese beetle traps in stock. Place them up and away from your garden. Blooming this month: Butterfly bush, hydrangeas, crape myrtles and more. Having pond plants is important for helping to maintain water clarity. Floaters help to reduce algae and give your fish cover while submerged grasses are essential for maintaining a balanced pond, serving as oxygenators and preventing too much buildup of algae. 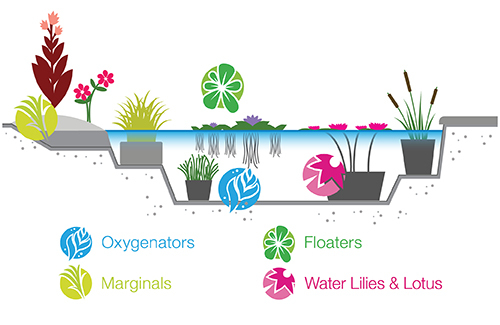 Fertilize all water lilies and lotus once a month to keep them blooming continuously throughout the summer. It’s time for you to switch from a spring fish food to a summer food once water temperatures reach above 70°. In warmer temperatures, fish metabolize faster creating a need for more protein.